New draft NICE guidance could help GPs, specialists and other health professionals spot a potential diagnosis of Lyme disease. It outlines when doctors can diagnose Lyme disease without the need for tests and when they should investigate further. Lyme disease spreads to humans through an infected tick bite. It affects up to 3,000 people a year in England and Wales, according to Public Health England. Saul Faust, Professor of paediatric immunology and infectious diseases at the University of Southampton and chair of the guideline committee, said: “Lyme disease may be difficult to diagnose as people can have common and unspecific symptoms, like a headache or fever, and they may not notice or remember a tick bite. 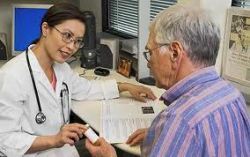 If a person has had a tick bite and a circular red rash, known as erythema migrans, the draft guidance recommends doctors diagnose and treat Lyme disease with antibiotics. Specific tests to help diagnose Lyme disease are also outlined in the draft guidance. These tests, called ELISA and immunoblot, look for antibodies created by the body’s immune system to fight the infection. If these tests come back negative, but unexplained symptoms persist, the draft guidance advises doctors seek a second opinion from a specialist. Professor Gillian Leng, director of health and social care and deputy chief executive, said: “Lyme disease is easy to treat. However, if left undiagnosed, it can lead to more serious symptoms. This can include heart problems, arthritis and problems affecting the nervous system, for example, weakness on one side of the face. Doctors should not diagnose Lyme disease simply if a person has been bitten by a tick but has no other symptoms, the draft guidance also says. The proposed advice is out for consultation until 6 November. Stakeholders and members of the public are invited to comment.